A couple months ago Drew invited me to come on his & Keirans new podcast, Narwhals, and we were able to catch up and schedule a time that worked. 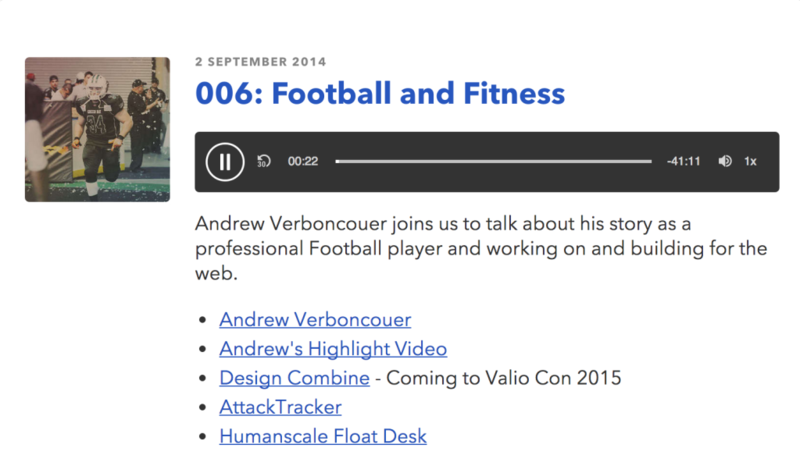 “A podcast about design, development, business, family and fun. Join Drew Wilson and Keiran Flanigan as they share their experience on making a living building products. Drew & Keiran are Narwhals so it’s fitting that their podcast is about the same. They build A LOT of things. If you haven’t heard about it yet, I’d recommend the book Drew wrote along with Josh Long, called Execute. It explores his process and how you need to do things when you’re inspired and keep that inspiration going through from the first idea up to the launch of the project. I’ve known Drew online for a while but we’ve never actually talked so it’s always interesting when you finally get the chance. I think I first reached out to Drew when he was releasing one of his first products, Firerift. At the time, Eric, Kris & I were working on a platform called 92oh! that was a nightlife and entertainment site for all things in the 920. We ended up not using Firerift and usee WordPress for the beta version instead. Fast forward about 5 years and here we are. We’ve kept in touch mostly through Twitter & Dribbble. If you’re interested, go ahead and take a listen to the podcast here: Narwhals Episode 006: Fitness & Football. There are some things I wish I would’ve conveyed better. Every time you step in a gym or wherever it is that you’re working out, you have the opportunity to push through your mental barriers or choose to stop. Sometimes our bodies are tired and we let our minds tell them when it’s “ok” to stop or when “that’s good enough.” The same thing goes for being a narwhal, an entrepreneur, a creator. People all around you are telling you that your idea doesn’t have any hope, your situation will never improve, your skills aren’t good enough, you don’t have enough experience, you’re just dreaming, etc. But you and only you can dictate what your future holds. Your will, your actions, and your determination will dictate that. When you start believing it whole-heartedly and make a choice about what you truly want, anything is possible. This applies to family, work, fitness, finances, anything. Once you start believing it, your actions will change from reactive to proactive. You will be able to make choices and not decisions. Blur the lines between what you think is possible and what actually is. Push yourself farther than you thought you could go. Keep going when your body tells you to stop. Focus your mind and tell your body what you want to happen. Release endorphins to combat stress and feel great mentally and physically. Make daily tasks easier with better overall health. Let me know what your thoughts are, hopefully you get an opportunity to listen to some of the great guests that appeared on the podcast. There are a lot of people that build amazing things and have great stories to tell.